People often assume that because I am a full-time professional player and saxophone teacher that I must have started very early in life. They also often assume too that, unless you start practising music as young as possible, there isn’t much hope for you becoming a competent player. The truth is though, the best time to start playing the sax is that moment when you feel that you’d really love to be able to pick the instrument up and make it sing. The "right" time to start playing the saxophone for me personally was when I was introduced to the instrument by a new friend while on holiday. As soon as I had the sax in my mouth and started making the first tentative sounds, I realised with an absolute passion that, no matter how hard it was, no matter how rubbish I sounded, playing the sax was something that I wanted to do. I was in it for the long game. I was 26 years old and from that moment on I enrolled myself in the persona of a sax player. So really the short answer to the title of this blog post, in my opinion at least, is that the best age to start playing the saxophone is when you have the desire to do so. And that could be at any stage of life. I have taught children as young as five years old. My oldest student is over 80 years old, and I teach students of all ages in-between. In this blog post I'm going to focus primarily on the childhood years and early teens. I'll be covering the teenage years and adulthood in a subsequent post so please do sign up to my blog if you'd like to find out more about that topic. When it comes to teaching the sax, my approach is not to “push” anyone, and especially not children, into music. I prefer to “pull” them into it. And I aim to do that by making the learning process as fun, enjoyable and inspiring as possible. I strongly believe that if you force children into music, then what you can risk ending up with is a very capable musician who hates playing their instrument. The last thing I want is a competent but unhappy musician! I believe that the best (and happiest) musicians are the ones who love playing. The ones who feel a connection to music and who love their instrument with a passion. My role is to nurture that passion - and I don’t think that can be done by force. Of course we need to teach children how to be tenacious, responsible and dedicated and to understand how essential practising their instrument is (even when they don’t always feel like it.) In my opinion though, the best way to achieve this is by bestowing these traits, and the whole subject of saxophones, with an irresistible magnetic pull. The two main advantages of starting playing the saxophone very young are that you have more time left in which to learn and your brain is so very well set up for absorbing and retaining information. If you make learning fun for the very young student, the rate at which they can learn is astounding. Children can also be much more open to making mistakes than older people, it just seems to bother them much less. This more carefree approach accelerates learning because it allows greater freedom of expression without worrying about how they look or sound. Younger kids are also at the stage of life where they are learning new things pretty much all the time, and so they are often more comfortable than an adult who may not have been in a learning situation for a long while. There are of course some physical considerations when thinking about a very young person taking up the sax. They have to be physically big enough, and strong enough, to be able to pick up and hold the instrument. A typical alto saxophone weighs about 5 kilograms, and sometimes more depending on the model. That’s well over half a stone - a lot of weight to have hanging round your neck. A young person's hands also need to be big enough to cover the keys. So, in my opinion, and this is of course dependent on the individual, the youngest I think that you can seriously take up the sax (in terms of being able to comfortably handle the instrument at least) is around 7 years old. The great news for kids though, is that there is a saxophone which has been specially designed for children! It's called the Trevor James Alphasax and it's a real innovation in saxophone design. The Alphasax looks and sounds pretty much exactly the same as a regular alto, however it's been completely redesigned and some of the very lowest and very highest keys have been removed. As a result it is much lighter, weighing in at 1.86 kg which is 33% lighter than a regular saxophone. I have personally owned two of these instruments and I think they are excellent for children as a starter sax. One of the downsides to starting the sax very young is that children can sometimes be rather easily distracted and sometimes their concentration span is still developing. Lessons that are thoughtfully structured, that include lots of fun activities and short breaks for a bit of conversation and sharing of ideas, are often more compelling and enjoyable to a very young person than say a solid 60 minutes of saxophone tuition. By the time kids are in their teens, the physical considerations of playing the sax (the weight of the sax, the distance between the keys etc) are usually not so much of a factor as they are for younger children. Teenagers are still very much in the learning frame of mind too, which means they're ideally placed to take on new information in an open way. Some younger teens can be more self-conscious and less communicative. They may also have a lot of other significant changes and demands in their life, both personally and at school, so these challenges may affect how they respond to their lessons and how much time they realistically have to practice. Having said that though, anywhere in your teenage years is a great time to start because, you have so many more years ahead of you in which to learn and grow. So if the desire is strong then I would certainly suggest starting the saxophone as a teenager. 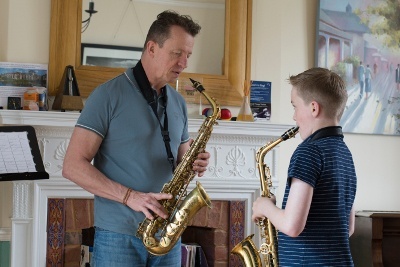 As a saxophone teacher, my primary objective with younger students, whatever their age or ability, is to encourage them to enjoy the experience of learning the sax. If I can do that, and if I can inspire a passion and genuine love for the subject, then everything else will flow from there.